Portrait of Mary Newbury Adams, MS 10. Since today is Election Day around the nation, let’s talk about our women’s suffrage collections. We have several, which we’ve talked about on the blog a few times: see related posts here. Read up on Mary Newbury Adams, a founding member of the Northern Iowa Woman Suffrage Association (pictured above), or Carrie Chapman Catt, a president of the National American Woman Suffrage Association. A full range of Iowa State’s women’s collections can be seen here. Another way to celebrate Election Day is by making one of Carrie Chapman Catt’s favorite desserts – try a cranberry souffle, strawberry shortcake-biscuit style, or something else from the Suffrage Cookbook available online through our digital collections. 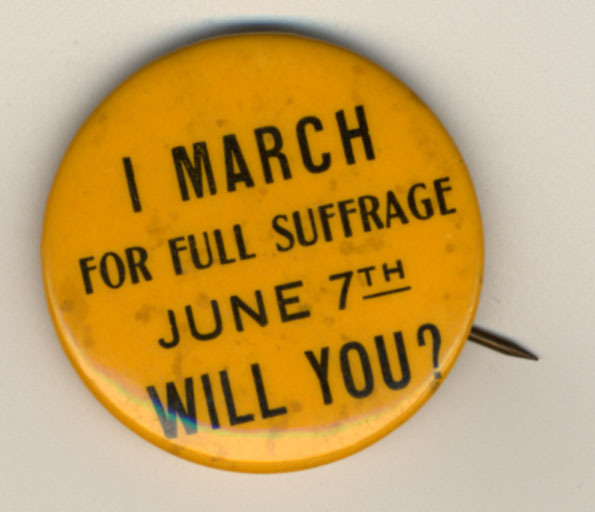 Women’s History Month: New Addition to the Woman Suffrage Collection! 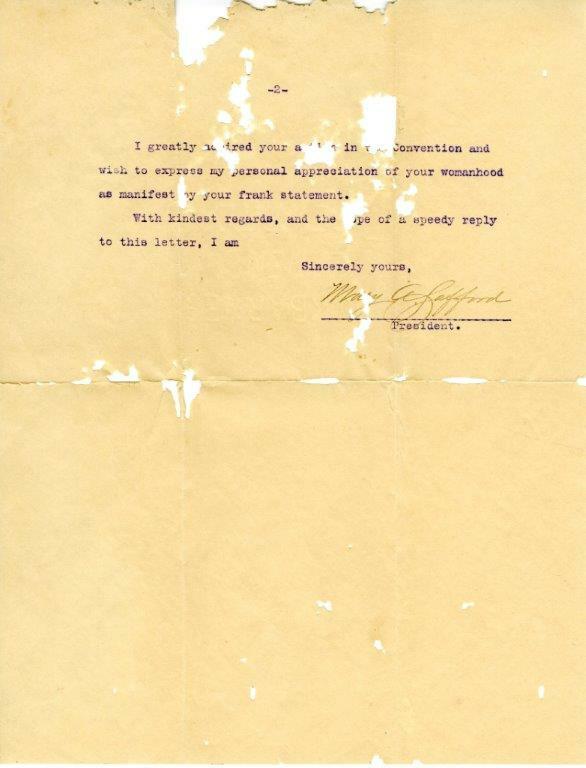 The department recently received a letter, pictured below, that has now been placed in the Woman Suffrage Collection, MS 471. In any event, I wish to congratulate you on the honor conferred, tho [sic] you may think yourself more in need of sympathy. That is understood, at all times, on my part. I urge all this for the sake of our common cause, and wish to add my personal urgent request that you do not permit anything to cause you to refuse to serve. I greatly admired your [action] in [the] Convention and wish to express my personal appreciation of your womanhood as manifest by your frank statement. What was this “frank statement?” What exactly went on at this convention? Perhaps someday we’ll know more about all of this, but in the meantime we have many other women’s rights-related collections that are worth viewing. These include Iowa State University. 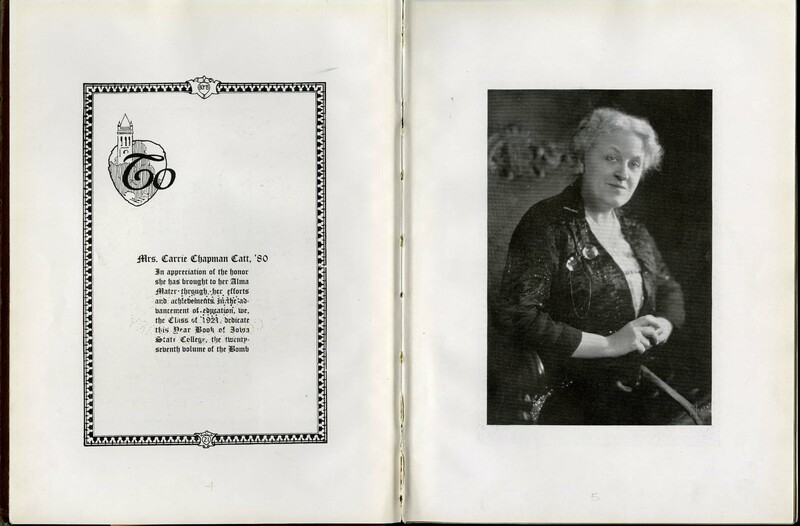 University Committee on Women Records, the Carrie Chapman Catt Papers, and the collections within the Archives of Women in Science and Engineering. Also see the Women’s Collections subject guide. If you’re at all curious about the history of women’s rights in Iowa, come in and read the rest of the letter and have a look at any of these great collections! 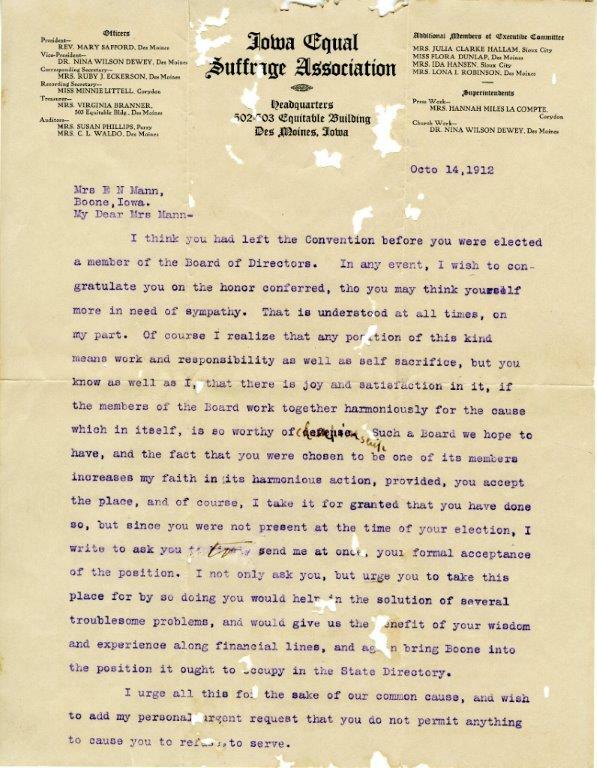 In celebration of Women’s History Month, today we’re highlighting a newly digitized collection of correspondence: a selection of Mary Newbury Adams letters from the Adams Family Papers found on our Digital Collections website. Mary Newbury Adams was born in Peru, Indiana, in 1837 to Samuel and Mary Ann (Sergeant) Newbury. Her father strongly believed that both men and women should be educated, and so she attended Mrs. Willard’s Female Seminary in Troy, New York, where she graduated in 1857. A few months later, she married Austin Adams, a young lawyer who had graduated from Dartmouth College and Harvard. They moved to Dubuque, Iowa, where he eventually became a judge and was later elected to the Iowa Supreme Court and became chief justice there. 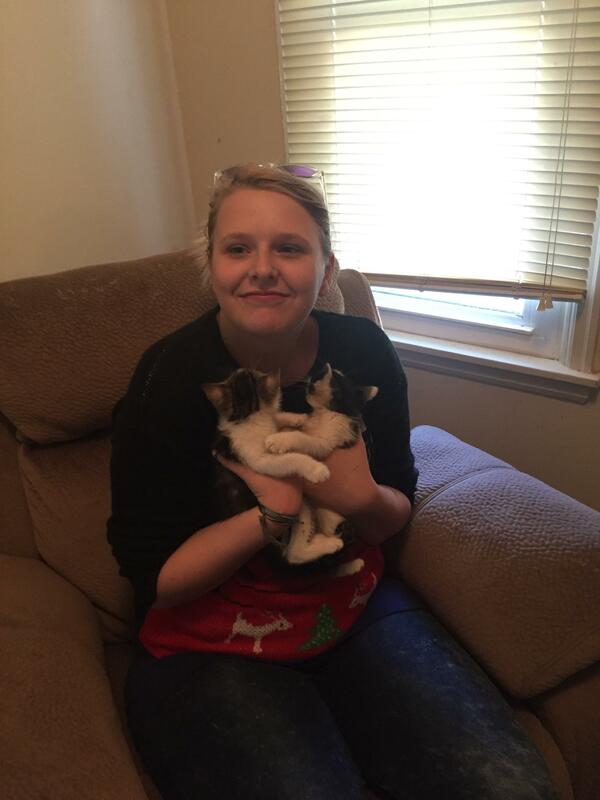 The Adams had four children, Annabel (b. 1858), Eugene (b. 1861), Herbert (b. 1863), and Cecilia (b. 1865). Mary Newbury Adams was an avid student of science, history, philosophy, and poetry. In a letter to her sister Frances, she explains that she has been studying earlier that day about the formation of minerals. “I have little time to go to the library now,” she writes, “but I manage to keep one or two subjects on hand to think about – just to hang my thoughts on.” She adds, “I never was so driven in household matters” (November 9, 1869). She established the Conversational Club of Dubuque in 1868 to promote access to education and ideas among women. Club meetings were held in the homes of members, and the topics discussed included education, local progress, political science and economy, mental and moral philosophy, the fine arts, political revolutions, belles lettres, ecclesiastical history, natural philosophy, and physical sciences. Reflecting on the importance of the clubs to women’s lives, she writes to her sister, “Our literary clubs are getting along finely and their beneficial effects are already evident in society. When women have clubs for study then they will not be driven for amusement to make society a business. Any amusement made an occupation becomes dissipation. All dissipation ends in disease. No wonder our American women are so weak” (Letter to Frances Newbury Bagley, March 18, 1869). In another letter, however, she attributes women’s weakness to a very different cause: the stress that comes from a very active life. Many women today can relate to Mary’s frustrations! In 1866, Mrs. Adams became interested in women’s suffrage and did much to promote it through writing and speaking. She was a member of the Association for Advancement of Women, the American Historical Association, vice chairperson of Women’s Branch of the World’s Congress Auxiliary of the Colombian Exposition, and numerous literary societies. She was a founding member of the Northern Iowa Woman Suffrage Association. Mary Newbury Adams with grandchildren, circa 1898. Caption reads: [top row] Emily Goan, Adelaide Goan, Olive Adams, [bottom row] Percival Goan, Adele Adams (on lap), Harlow Adams. She wrote a letter home to her children on October 27, 1898, from the National Council of Women meeting in Omaha, Nebraska, describing her busy schedule, meeting with many people, old friends and new. She writes of her “level headed practical friend by my side Maria P. Peck.” Peck was another prominent Iowa woman from Davenport and founder of the Davenport Women’s Club (see entry: “PECK, Maria Purdy,” Woman’s Who’s Who of America: A Biographical Dictionary of Contemporary Women of the United States and Canada, 1914-1915. ed. by John William Leonard. New York, NY: American Commonwealth Company, 1914. pp. 633). The Mary Adams letters give a peek into the day-to-day concerns of a prominent Iowa suffragist and intellectual during her most active period. Be sure to take a look at the letters in Digital Collections. You can also come in to Special Collections and take a look at the entire Adams Family Papers, MS-10. To see what is included in this collection, take a look at the finding aid. And to find other important women you can research in Special Collections, check out our Women’s Collections subject guide. We always look forward to seeing you in Special Collections–online or in person! Did ISU have anything to do with the 19th Amendment? Why yes it did! Today, August 26th, marks the 90th anniversary of the 19th amendment becoming law, giving women in the United States the right to vote. 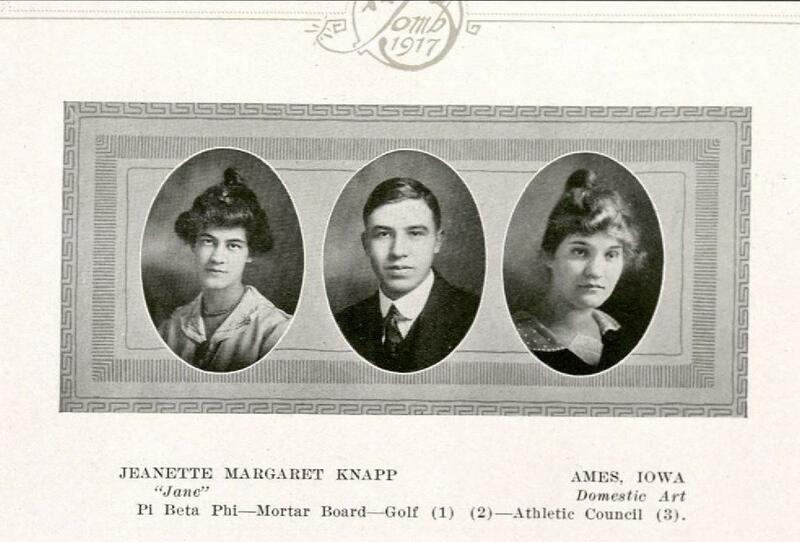 What might Iowa State have had to do with women gaining the right to vote back in 1920? 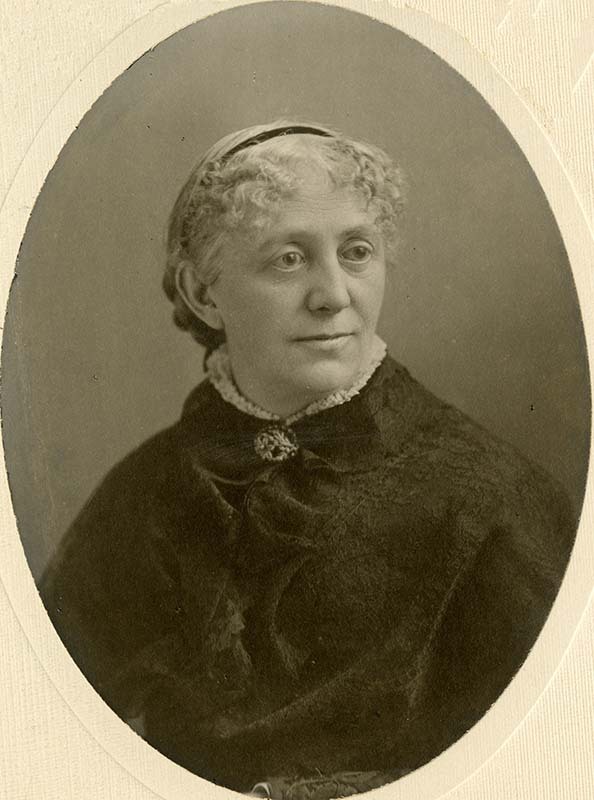 Carrie Chapman Catt graduated from Iowa State in 1880 at the top of her class. Catt worked diligently for woman’s suffrage both in the United States and internationally, and was the president of the National American Woman Suffrage Association (NAWSA) when the 19th amendment was passed. In fact, she was president of NAWSA for many years and came back to the presidency in 1915 to reorganize and strengthen the association. After the 19th amendment became law, she then helped organize the League of Women Voters. Several archives hold the papers of Carrie Chapman Catt, including ISU and the Library of Congress. Microfilmed versions of some of these collections are held in the library’s Media Center and can be found by searching the library’s catalog. The Library of Congress also has some of her papers online. 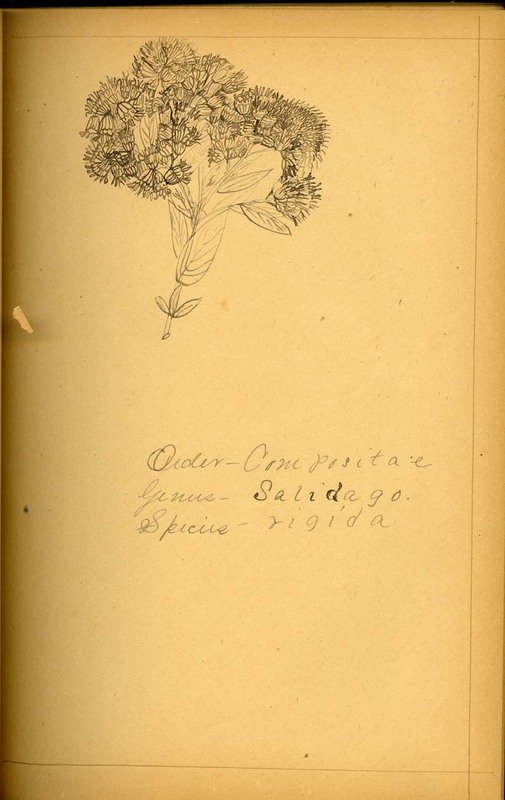 We also have a collection of her papers, and the finding aid for her collection is online. Below are some of the highlights from her collection here at ISU, which contains some materials from when she was a student here as well as when she was working for woman’s suffrage. 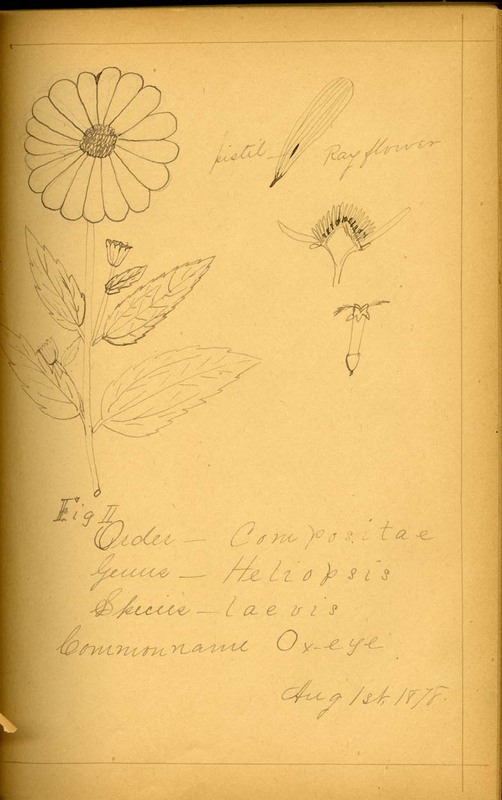 Pictured here are a couple images from Catt’s botany notebook, which contain careful notes and illustrations in her very neat handwriting. 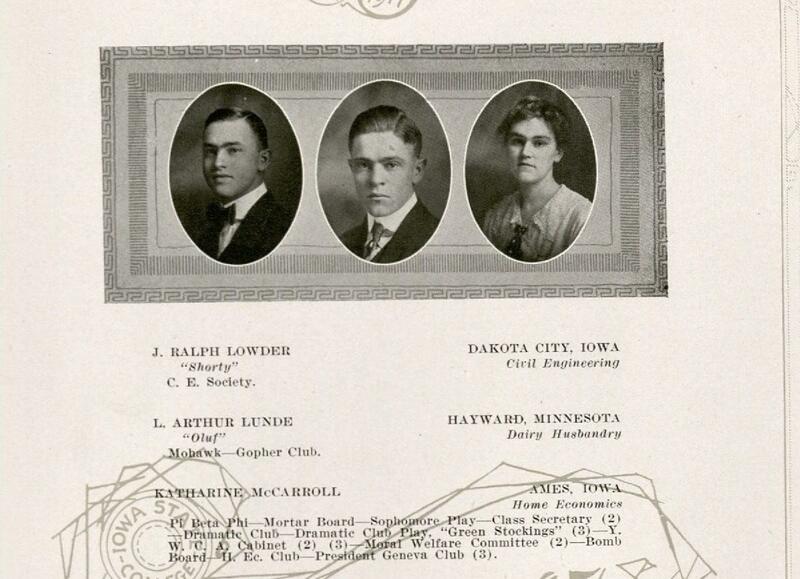 In 1921, Catt became the first woman to deliver a commencement address at Iowa State. 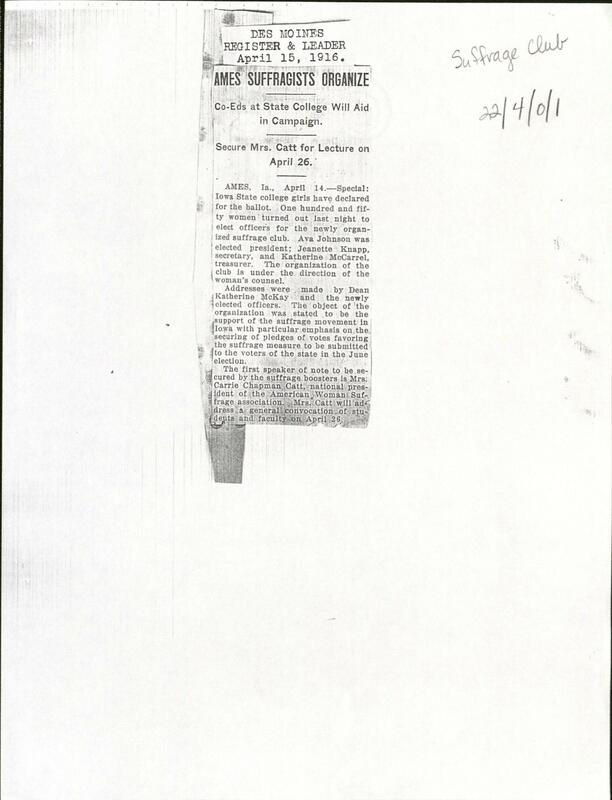 The collection contains a newspaper article announcing Catt’s visit to Iowa State, and also a copy of her address which was published in The Alumnus. 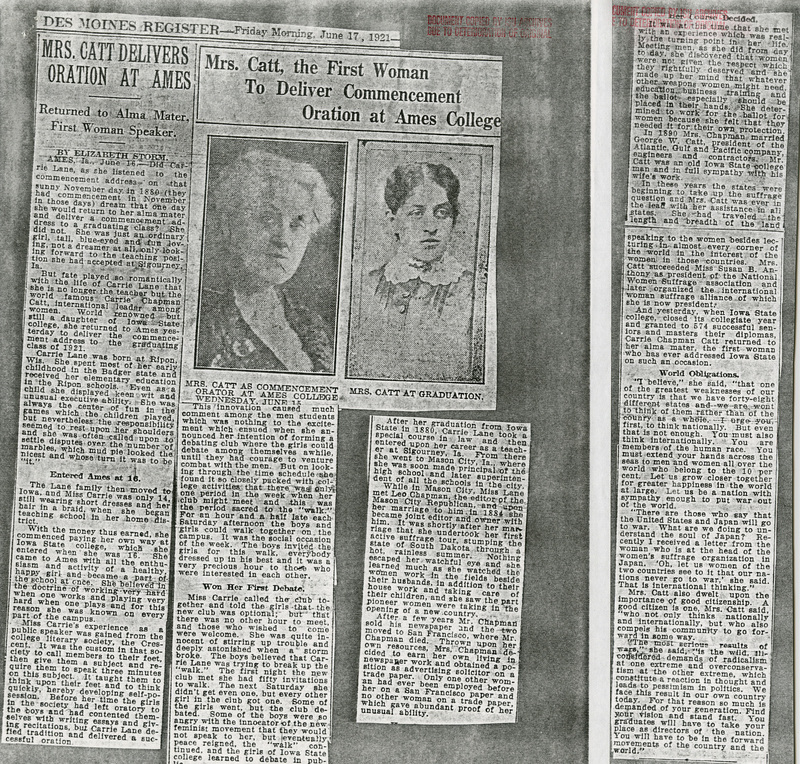 The news clippings also reveal that Catt maintained ties to Iowa State, visiting her alma mater at least once during the fight for suffrage in 1917. In addition to the materials in Catt’s Papers, we also have a number of artifacts which Catt once owned. Most of these are suffrage buttons and pins, a few of which are pictured below. If you would like to learn more about Carrie Chapman Catt, please visit our finding aid and the Carrie Chapman Catt Girlhood Home and Museum website, which also contains links to other collections of Carrie Chapman Catt materials and an interactive time line. There are quite a number of online resources related to the suffrage movement, including a fun online scrapbook which contains articles, letters and editorials from The New York Times about the women who fought for and against suffrage here in the United States.